I wonder whether there is a shortcut to make a simple list out of list of lists in Python. I can do that in a for loop, but maybe there is some cool "one-liner"? I tried it with reduce, but I get an error. Explanation: the shortcuts based on + (including the implied use in sum) are, of necessity, O(L**2) when there are L sublists -- as the intermediate result list keeps getting longer, at each step a new intermediate result list object gets allocated, and all the items in the previous intermediate result must be copied over (as well as a few new ones added at the end). So, for simplicity and without actual loss of generality, say you have L sublists of I items each: the first I items are copied back and forth L-1 times, the second I items L-2 times, and so on; total number of copies is I times the sum of x for x from 1 to L excluded, i.e., I * (L**2)/2. The list comprehension just generates one list, once, and copies each item over (from its original place of residence to the result list) also exactly once. Note from the author: This is inefficient. But fun, because monoids are awesome. It's not appropriate for production Python code. This just sums the elements of iterable passed in the first argument, treating second argument as the initial value of the sum (if not given, 0 is used instead and this case will give you an error). Because you are summing nested lists, you actually get [1,3]+[2,4] as a result of sum([[1,3],[2,4]],), which is equal to [1,3,2,4]. Note that only works on lists of lists. For lists of lists of lists, you'll need another solution. The extend() method in your example modifies x instead of returning a useful value (which reduce() expects). Here is a general approach that applies to numbers, strings, nested lists and mixed containers. """Yield items from any nested iterable; see Reference.""" This solution is modified from a recipe in Beazley, D. and B. Jones. Recipe 4.14, Python Cookbook 3rd Ed., O'Reilly Media Inc. Sebastopol, CA: 2013. Found an earlier SO post, possibly the original demonstration. I take my statement back. sum is not the winner. Although it is faster when the list is small. But the performance degrades significantly with larger lists. The sum version is still running for more than a minute and it hasn't done processing yet! It's a generator so you need to cast the result to a list or explicitly iterate over it. It's a log-log plot to accommodate for the huge range of values spanned. For qualitative reasoning: Lower is better. 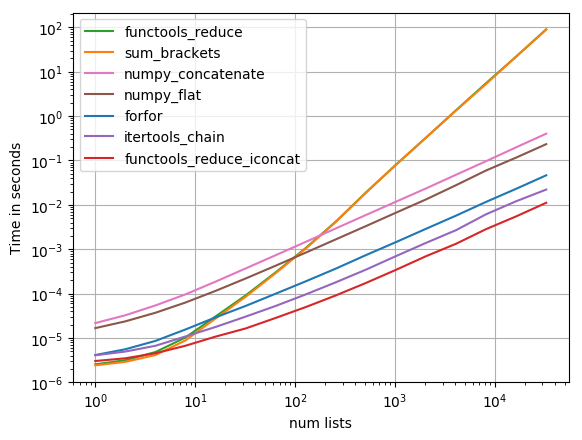 The results show that if the iterable contains only a few inner iterables then sum will be fastest, however for long iterables only the itertools.chain.from_iterable, iteration_utilities.deepflatten or the nested comprehension have reasonable performance with itertools.chain.from_iterable being the fastest (as already noticed by Nico Schlömer). Why do you use extend? Note: extend is more efficient than + on lists. Consider installing the more_itertools package. As of version 2.4, you can flatten more complicated, nested iterables with more_itertools.collapse (source, contributed by abarnet). An bad feature of Anil's function above is that it requires the user to always manually specify the second argument to be an empty list . This should instead be a default. Due to the way Python objects work, these should be set inside the function, not in the arguments. The accepted answer did not work for me when dealing with text-based lists of variable lengths. Here is an alternate approach that did work for me. 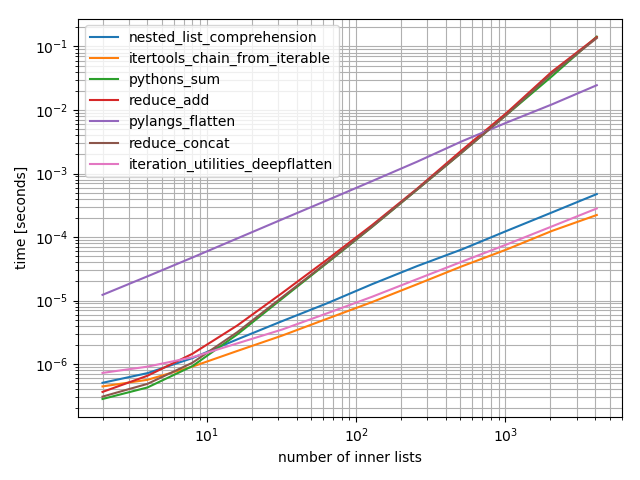 matplotlib.cbook.flatten() will work for nested lists even if they nest more deeply than the example. Edit 11/02/2016: Only works when sublists have identical dimensions. This Code also works fine as it just extend the list all the way. Although it is much similar but only have one for loop. So It have less complexity than adding 2 for loops. """Flatten an arbitrary deep nested list of lists of integers. This may not be the most efficient way but I thought to put a one-liner (actually a two-liner). Both versions will work on arbitrary hierarchy nested lists, and exploits language features (Python3.5) and recursion. This works in a depth first manner. The recursion goes down until it finds a non-list element, then extends the local variable flist and then rolls back it to the parent. Whenever flist is returned, it is extended to the parent's flist in the list comprehension. Therefore, at the root, a flat list is returned. The above one creates several local lists and returns them which are used to extend the parent's list. I think the way around for this may be creating a gloabl flist, like below. Although I am not sure at this time about the efficiency. Note: Below applies to Python 3.3+ because it uses yield_from. six is also a third-party package, though it is stable. Alternately, you could use sys.version. In the case of obj = [[1, 2,], [3, 4], [5, 6]], all of the solutions here are good, including list comprehension and itertools.chain.from_iterable. One element, 6, is just a scalar; it's not iterable, so the above routes will fail here. One element, 'abc', is technically iterable (all strs are). However, reading between the lines a bit, you don't want to treat it as such--you want to treat it as a single element. The final element, [8, [9, 10]] is itself a nested iterable. Basic list comprehension and chain.from_iterable only extract "1 level down." Here, you check that the sub-element (1) is iterable with Iterable, an ABC from itertools, but also want to ensure that (2) the element is not "string-like." The function flatten takes in lst as parameter. It loops all the elements of lst until reaching integers (can also change int to float, str, etc. for other data types), which are added to the return value of the outermost recursion. Not the answer you're looking for? Browse other questions tagged python list multidimensional-array flatten or ask your own question. How to merge multiple lists into one list in python? Comprehension for flattening a sequence of sequences? in Python, How to join a list of tuples into one list? Python idiom to chain (flatten) an infinite iterable of finite iterables?